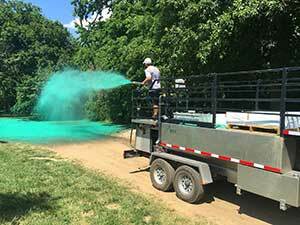 SWX Global introduced the APEX XA1200—the newest addition to its line of hydroseed and environmental spray applicators. The APEX XA1200 comes with a Vortex slurry pump that discharges a variety of materials without modifications to the pump or adjustment of mulch manufacturers’ mixing instructions. The pump allows for maximum emptying of the slurry tank. The product features a tank capacity of 1,200 gallons, a Tier 4 Doosan Engine and two variable speed, hydraulically driven agitators. Additionally, the APEX power pack design is removable, replaceable and upgradable. A stainless-steel mixing tank with corrosion-reducing materials for the tank top and working platform reduces maintenance, and a raised loading hatch, a fully enclosed engine compartment and a hydraulic design maximize efficiency, SWX Global said. The XA1200 can be used for alternative daily cover or final cover on landfills, mine reclamation, seeding of roadsides, airports, pipelines, golf courses, agriculture sites, oil and gas fields, wind farms, quarries, solar fields, resource stock piles, railway lines, resorts and post-fire rehabilitation projects, according to the company. All APEX applicators are supported by a 15-year protection against tank corrosion, three-year hydraulic components and two-year engine warranty.